There comes a time in every artist’s life when they have to look in the mirror and decide whether their art should be a hobby or a way of life. When it came time for Bronx native Mickey Factz to decide what his art meant to him, he chose music, abandoning a spot at NYU Law School to embrace hip-hop full time. Factz honed his music and crafted his unique sound by releasing six full-length mixtapes, including his critically acclaimed release Heaven’s Fallout in 2007 and his high concept mixtape, The Dark Phoenix Alpha. 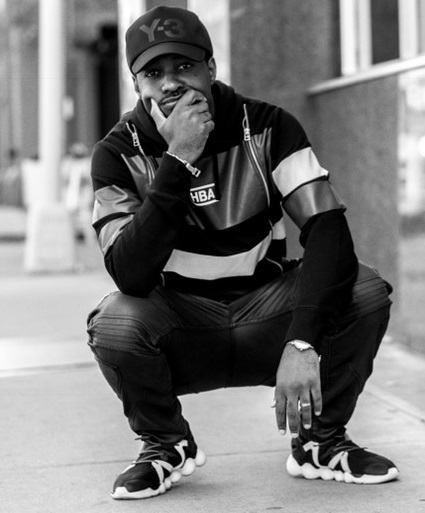 In addition to his solo work, Mickey Factz has worked with some of the hottest artists in the industry, including Drake, B.o.B., The Cool Kids, Travis McCoy, and Hip-Hop pioneers like Afrika Bambaataa. Factz parlayed his growing body of work into a global following and an impressive amount of media attention including features in major music magazines Fader, Spin, and Complex. Mickey even appeared on the cover of XXL Magazine as part of their 2009 Freshmen 10 issue. In 2009, those high-profile appearances caught the attention of Honda Motor Company, and Factz was selected to be the face of their “Rhymes & Reasons” marketing campaign which was which was featured as part of Honda’s national initiative for their flagship car, the Accord. He also applied his marketing and internet knowledge to helping other artists forming the artist management/brand marketing company GFCnewyork. 2010 was a big year for Mickey Factz. His hard work and perseverance paid off when he signed a major record label deal with Battery Records, a subsidiary of Jive Records and released his critically acclaimed mixtape I’m Better Than You. In 2011, his success in the mainstream continued. He released his single For The Culture which features Marsha Ambrosius and the video soon found its way to all major music television outlets. Not wanting to keep his fans waiting while he prepped his debut album, he released the mixtapes Love.Lust.Lost and followed with Mickey MauSe the following year. Mickey MauSe received rave reviews and the project has been hailed by many to be a visual and lyrical masterpiece. Following the success of Mickey MauSe, Factz continued to prep for his debut album The Achievement. In October of 2013 he released the first single from the album, Zen which features Hip-Hop artist Yelawolf. After the release of Zen, Factz had the opportunity to be the opening act for long time friend Lupe Fiasco on the rappers Tetsuo and Youth Preview Tour in late 2013. Following the Tetsuo and Youth Preview Tour, Mickey took a brief hiatus from the entertainment industry. He resurfaced in 2014 with the release of $4.14, which premiered on MTV Jams. In July of 2014, Mickey released his first mixtape of the year, 740 Park Avenue and quickly followed with Love. Lust. Lost 2. His second television world premiere of the year came with the release of Detroit Red, which premiered on Revolt TV. The following year, Mickey spent time reconnecting with his fans building his audience. He headlined his first national tour called the “Red or Blue Pill” Tour and began working on the highly anticipated mixtape, Y-3. Y-3, which was released in September of 2015, featured heavyweights such as Charles Hamilton, CyHi The Prynce, Nikki Jean, Tony Williams, and El-Zhi with production from Key Wane and the legendary Just Blaze. Mickey Factz is the true embodiment of artistry. His body of work stands as homage to the culture while awash in today’s spirit of innovation. Only agents authorized by Max Agency and WAR Media are permitted to solicit offers for booking tour dates.